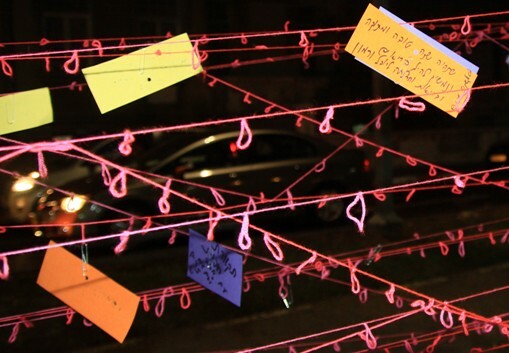 “A street singer giving it her best”, “I learned to make gefilte fish”, “coffee with a friend” – these were some of the notes hanging between the trees on Rothschild Boulevard last night, September 7, 2010, but most of the notes were about love. 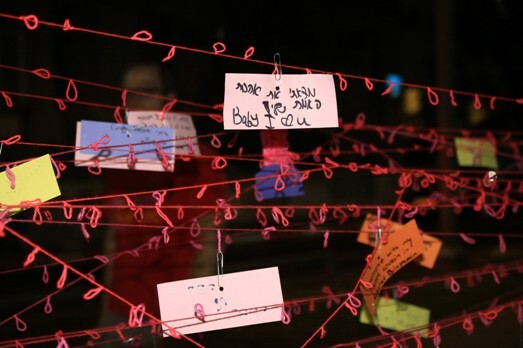 A bright pink wool web with loops was woven between two trees by artist Rinetta Klinger, who invited passersby to participate in the installation, writing down: What made you recently happy? I arrived on Rothschild close to 21:00, as the artist wondered whether to take down the installation or try to keep it up through the night. Two women walked by and stopped to add their thoughts to the installation. “It’s wonderful that the installation focuses on happiness, it’s beautiful and very ‘Tel Aviv’. It’s nice to stop and remember a happy moment,” said Merav who recently set a new personal best in bowling. Klinger first visited Israel twenty years ago, speaks fluent Hebrew and visits often, at one point living in Israeli for three years. Having studied fashion design, she is “very into textile and fabric, using a lot of color.” She has been pre-occupied with the subject of happiness, how some people don’t have much and yet are happy, while others, who seem to have all the necessary requirements for happiness – are not. It’s a good time to take a break from urban angst and remember all those moments of happiness. If you weren’t on Rothschild last night, you can still add your thoughts to www.facebook.com/BeSimplyHappy.